But I didn’t know any of that when I first smelled Bois des Iles, which was one of the first fragrances to captivate me when I began my sojourn into PerfumeLand. I had started, you see, with a “Pick Four Chanel EdTs” sampler pack from The Perfumed Court. I wanted to smell the classics first, and I knew No. 5 already, so I chose No. 19, No. 22, Cristalle, and Bois des Iles. I tried Cristalle first, and was not moved – except that I recognized the drydown as the smell of my mother’s best friend when I was a kid. No. 19 came next, and I liked the topnotes, which I described to myself as “old-fashioned,” not really knowing what galbanum was. Then I found that I had my wrist glued to my nose, and from then on we were best buds, No. 19 and me. No. 22, which I’d identified from the notes as the one most likely to please me, was instead a sugar-bowl nightmare, with a powdery-crunchy texture that I disliked from the get-go. Bois des Iles, from the first minute I put it on, was beautiful. It reminded me a great deal of Mom’s No. 5, and then developed a texture so unusual and so lovely that in describing it to myself, I pulled up an old memory. When I was fourteen, my family went to Florida on vacation. We went to Disney World, and Daytona Beach, and Weeki Wachee Springs, and Fort Augustine, and we also went to Sea World. My brother, then four, was fascinated with the shark tank, but the experience that stayed with me was petting the stingrays. 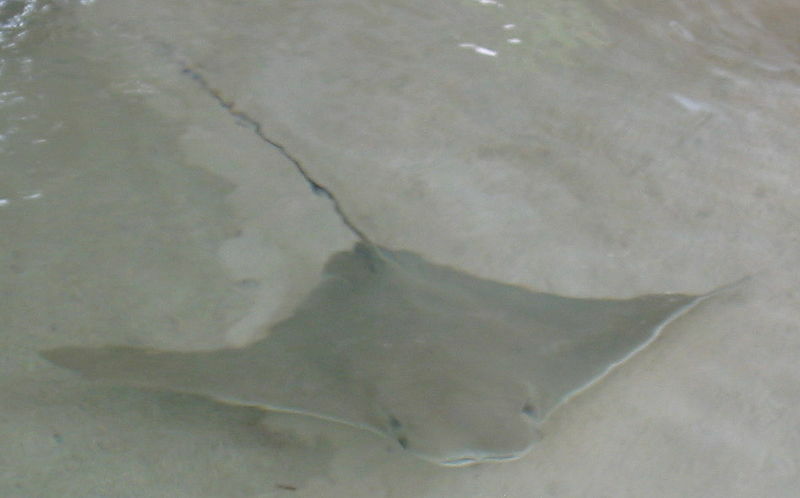 In a long but shallow pool, Sea World had several rays which had had their stings removed, and visitors were encouraged to pet the rays as they swam past. The rays didn’t seem to mind all the hands, at times appearing to seek out a patting hand the way my cat will arch her back under a piece of furniture, so I stuck my hand into the water as a ray swam past. It felt amazing – like wet velvet. Like wet, living velvet, really, because I could feel the ray’s body flexing and arcing as it moved its propelling tail, and it was warmer than the water surrounding it. My parents had to practically drag me away from the low pool so we could see the killer whale show, and I still wish I could go back and pet the rays again. Bois des Iles feels like the texture of the ray: soft, velvety, warm, but with a solid, flexible frame underneath. So what does it smell like? Well, as I mentioned, there are those aldehydes to begin with, much lighter than in No. 5, but with that sparkly-powdery-soapy brightness that says Proper Perfume to me. As the aldehydic veil lifts, you notice the floral blend floating past, and it too is reminiscent of No. 5, with that rose-jasmine-ylang heart. The florals always go by more quickly than I expect, and then we’re down into the deep heart-and-base that lasts a long time. This, like Chanel says, actually does smell like gingerbread: a spicy warmth that’s just a bit sweet, with that wonderful bitter edge of molasses. If you’re worried about the vanilla, fear not – it’s neither the sweet gourmand cupcakey kind nor Guerlain’s patented TarNilla, but rather, like really expensive vanilla extract behaves in a yellow cake, it gives the scent a roundness and depth without being identifiable as vanilla. BdI is definitely a Chanel, too – the identifying Chanel iris is present, noticeable mostly as that satiny texture that iris seems to give a fragrance, while itself disappearing, like the vanilla, into its surroundings. And then there’s that sandalwood. It’s beautiful, and nearly indescribable. As it is, I can only come up with adjectives without really telling you what real sandalwood smells like: creamy, tangy-sweet, complex but in a completely natural way, floral yet astringent with a clean “bite.” Once I’d smelled it here, I was then able to start picking it out of other fragrances – it seems particularly noticeable, and lovely, in vintage scents. My 1960s Arpege extrait has an enormous quantity of sandalwood in it, and although it is accented differently in Arpege, with oakmoss, patchouli, amber and musk, it’s unmistakable. I also have a small vintage bottle of Prince Matchabelli Stradivari, where the top and heart notes have been irretrievably damaged by age, but the drydown is a stunning harmony of sandalwood and cedar. Real sandalwood from the Mysore region in India has been overharvested, and although some quantities of oil from santalum album from a government-sponsored plantation in nearby Tamil Nadu are available, most perfumers have gone one of two routes in replacing it in their compositions. Option 1 is synthetics. 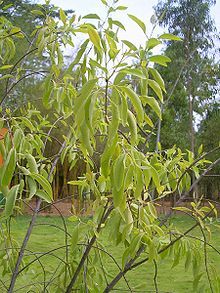 Several aromachemicals which mimic sandalwood are available: Polysantol, Javanol, Sandalore, Ebanol, Sandela, probably some others. However, the word is that none of these are excellent substitutes, just available ones. (Guerlain Samsara is famous, or perhaps infamous, for its proportion of Polysantol.) Option 2 is essential oil from real wood, produced somewhere else. This option includes the aforementioned Tamil Nadu sandalwood, or essential oil produced from santalum austrocaledonii, a similar species, in Australia, Vanuatu, or New Caledonia. Supposedly the New Caledonian and Vanuatuan sandalwood oil is very good, albeit lighter and a bit more astringent than traditional sandalwood. The kind grown in Australia is more plentiful, and priced lower, than the island versions,  but it is brighter still, with more bite and less creaminess. Option 3, of course, is a mixture of naturals and synthetics. I have no way of knowing, of course, but if I had to guess, I might postulate that Chanel is still getting its hands on at least some of that Tamil Nadu sandalwood. If anybody can afford it, it’s Chanel! However, it’s possible that they’re supplementing with the Australian. I notice that my decant of Bois des Iles, from the Les Exclusifs line, is clearly thinner than my original vial of BdI from TPC. Even “sprayed wet,” it is hardly smellable from a yard away, and by the time the gingerbread accord shows up, I can only smell it by hoovering my arm. Other people have said that their LE version of BdI smells just fine to them. Maybe it’s me. Maybe my decant was the first sprayed out of the bottle, and the alcohol had floated to the top. Maybe that particular bottle, so kindly ordered from the Chanel boutique in Washington, DC, and so kindly split by hand by the Queen Enabler, Dear Daisy, was insufficiently macerated (see FlitterSniffer’s post here at Bonkers about Perfume, on how a coveted decant of Guerlain Plus Que Jamais was so different from the way that it ought to smell that even the SA acknowledged it). My Les Exclusifs decant does have the right smell – it’s just faint, as if it had been diluted by half. Notes for BdI: Aldehydes, jasmine, damask rose, ylang, bitter almond, gingerbread, iris, vanilla, sandalwood, tonka bean, vetiver. Dear Daisy also sent me a sample of Sonoma Scent Studio Champagne de Bois, saying, “You like Bois des Iles, right? Try this.” And she’s quite correct – CdB, while not a dead ringer for BdI, is undeniably in the same vein, and could conceivably be labeled an homage to Bois des Iles. Certainly perfumer Laurie Erickson has smelled Bois des Iles, and I’d betcha money she loves it. Since my small vial of CdB was nearly exhausted, I ordered a larger sample from SSS recently in order to test for this review. My padded envelope came in the mail, and the samples I’d ordered were further encased in a small plastic envelope – yet I could smell the Champagne de Bois the instant I opened the larger mailing envelope. A tiny bit had leaked out of the spray vial, and it immediately perfumed the air. SSS fragrances are fairly concentrated, I’ve noticed before. My favorites, Tabac Aurea and Velvet Rose, are so strong that one spray lasts for hours. This is true for Champagne de Bois as well. The SSS website notes that the fragrance concentration ranges from 20 to 24%, which makes all these scents essentially parfum strength. (I nearly overdosed on Tabac Aurea once. If you’re considering three sprays – well, take it from me, it’s a bad idea. Seriously, don’t.) A drop of CdB lasts about six hours on me, and when sprayed, eight to twelve hours. The fragrance starts with sparkly aldehydes, and something that reminds me of Andy Tauer’s distinctive mandarin note, up front, and a jasmine-spice bit shining through the aldehydes. Although it’s not listed, I’d swear there was a tiny bit of rose in there, but just a tad. I love clove and spicy notes, and I think I’d also say there was a bit of some other spice in there with the clove – cardamom, maybe? I don’t know. It does feel more symphonic than clove alone, which can be a rather single-minded, Genghis Khan take-no-prisoners sort of accent. Champagne de Bois has a lovely sandalwood focus as well. I asked Laurie if she’d be willing to identify her source for sandalwood, and she was kind enough to tell me that she uses a blend of real sandalwood and synthetic. It’s a very beautiful interpretation of sandalwood. The amber, though, tends to take over toward the end, so that the last couple of hours are a little sweeter than I’d like. For this review, I performed two serious, all-day, wrist-to-wrist comparisons. The first time, I tried it with a drop of CdB from a sample vial on my left wrist and two drops of BdI from my TPC sample on my right. The second test was two generous spritzes from my BdI decant on my left wrist and one small spritz, what I call a “squidge,” of CdB on my right. There are strong similarities between the two, but a few distinct differences. Right from the start, CdB has lighter aldehydes, and that orange-citrus note I mentioned before, flowing very quickly into the jasmine and spice phase, while BdI spends a good 15 minutes in the aldehydic stage before changing. The CEO actually prefers the topnotes of Bois des Iles, although I don’t myself, finding them a little soapy. Once the jasmine-spice of Champagne de Bois has settled in, CdB is unusual and lovely, and my family seems to prefer it over BdI’s aldehyde-classic floral blend. In fact, CdB stays in this lovely spicy-floral stage for quite some time, during which the rich wood-and-amber base begins to float up, creating a lovely spice market effect. It’s beautiful and luxurious, and while I know some people like to wear CdB in the summer, it’s too rich for me in the heat. So who wins? I still don’t know. (And I still think there’s something wrong with my Les Exclusifs Bois des Iles decant, which is considerably thinner and soapier than my pre-LE edt sample from The Perfumed Court.) I really love the drydown of BdI – it is simply gorgeous, and so perfect that I can’t imagine any way to improve it, except maybe to have it last longer. And CdB really gets too amber-sweet near the end of the ride. But on balance, I get hours of spicy-woody goodness out of Champagne de Bois. Hours! For cheap, too! At the time of writing, you can buy a 200ml bottle of Les Exclusifs Bois de Iles for about $220, and a 15ml parfum for $160 – but a 30ml bottle of parfum-strength Champagne de Bois will set you back about $60. I know it’s vulgar of me to throw cost per wear into the mix, but hey, I got limited Perfume Bucks. If you’re giving me perfume for free, I’ll take a bottle of Bois des Iles parfum, thanks. But that’s only because I can manage to snag some Champagne de Bois on my own. From Perfume Shrine, Wikipedia, and Eden Botanicals. Images of wrestlers, sting ray, and sandalwood sapling are from Wikimedia Commons. Images of perfume bottles are from Fragrantica. Haven’t tried either of these, although I do have a sample of CdB somewhere. Sounds like I would like that one better as I’m not so fond of aldehydes. Once it’s a little chillier, I will give it a whirl! Oh, do! And do wait for cooler weather, it glows. The aldehydes are much less prominent in CdB, and they mostly act like bubbles in champagne, just lightening the composition. BdI can be a bit… turpentiney, in the top, but the drydown is just to die for. Well… it’s definitely GOT aldehydes, BF. They’re just low-impact. Great throwdown! Thanks! I’ve never smelled the SSS but love BdI – like Cuir de Russie, it’s probably way more intriguing in parfum form (I’ve never tried it. skeered to. what if I luvs it?). 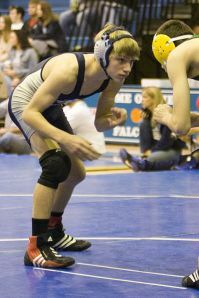 I’ll have to look up some SSS and do a throwdown of my own! You know, it’s funny – I DO like aldehydes. Just last week on NST somebody asked for recs on aldies, and off the top of my head I listed about 8 that I really dig before deciding not to go on adding the ones that I’m neutral on, or the ones I don’t like. I was surprised that No. 22 was so unpleasant on me. Oooh, I’ve been waiting for this review! I must sheepishly admit that I’m still trying to “get” Bois des Iles. It’s fine enough, but…. well, obviously the fact that I’m using language like fine enough shows that I’m missing something. I’ve been told that sometimes it takes several revisits before the nose falls for the beauty that is BdI (I console myself with the fact that 28 La Pausa was an instant “Holy Cow, I smell fantastic!”), so the plan is to sniff this again in a few months. Maybe my own throwdown between BdI and CdB will help, as CdB was just fun tofrom the get-go. I love the sparkly but elegant feel of it, and it’s become one of my goin’-to-church scents. (I reserve my “hey baby, how YOU doin’?” scents for date night with hubby….) However, I did also wear it camping this summer in Montana, so obviously CdB and I get along in the heat – yeah, yeah, Montana isn’t exactly Florida, but it was hot enough for me. Dionne – yeah, glad I finally got it finished and posted… (rolls eyes at own time mismanagement). I have yet to smell 28LP, but I tend to get on with many Chanels. I would give BdI a couple of tries – but, honestly, there’s SO MUCH out there to sniff, I wouldn’t bother pushing it. Every so often I revisit classics I used to hate, just to see if my nose has adjusted itself, and sometimes there’s a change in my perception (Silences was screechy the first time I tried it, but stunning the second and every time since) and sometimes not (nope, still hate Coco and Opium and Shalimar edt, even though Shal Lite is a favorite). Mals you did an excellent job reviewing and writing about these beauties , both superb in their own right. I’m also glad your feeling better because I am and boy I AM GLAD. Not being able to enjoy my perfume was especially painful because now I own up to the delight and love of wearing it for myself. I do favor BdI though just because I don’t really love the clove factor in CdB, it can get a lil’ too strong but CdB isn’t my favorite of Laurie’s anyways – Opal, Voile de Violette, and Tabac Aurea are the ones in that list, in that order! Also I love to spray heavily and darn it Laurie makes them so perfect that I can’t do that or risk suffocation with a smile on my face. Hey there T baby – thanks for the good wishes! I like both of these, and I really can’t quibble over someone preferring one or the other of them. It all comes down to personal preferences, anyway. I still haven’t tried all of the SSS fragrances either, including Opal and VdV. It’s funny, though, because most of them are either wild successes on me or utter failures. I’m still puzzled at how much I HATED Vintage Rose, when by the notes it should have been Mine, All Mine. Seriously, I keep trying it and having to scrub within 15 minutes due to nausea. The only other scents that do that to me are Estee Lauders, so there must be something common, but I don’t know what it is. Yep, they’re pretty strong. I actually admit to a slight preference for dabbing vs. spraying – maybe because my mom dabbed her No. 5, and it always seemed so elegant to me. Wonderful review – thanks. I’ve been looking forward to it too. BdI has been on my try list for ages but, well, somehow I hesitate over fragrances which I know i can’t afford a FB of (‘scuse the grammar). Although I know I might well NOT want a FB, I hate not having the option. CdB is a different story, cost-wise. I have a sample and am just about to order the 5ml purse spray. My initial reactin to CdB on my wrist was: ‘coconut, thick and a bit sweet’. Knowing that coconut is nowhere near the list of notes, I offered my wrist to my 12 yo son for a sniff. ‘Hmmm … coconut and chocolate … ‘ he said. So I’m not bonkers. I do love the fragrance, but why do both of us get scents from it that aren’t supposed to be there? It must be some combination of the spices. Dunno. I’ll wear it again to tomorrow and concentrate hard. And you are SO right – one spary (and sometimes just one dab) of SSS fragrances is often enough. My other favourites are Femme Jolie and Cameo. Cameo I wear at night, and I noticed recently that my copy of Perfimes The Guide smells of Cameo. I often read it in bed! You got *coconut* out of CdB?? Hm. Hmmmm. I can’t twist CdB around in my head to get to coconut… wonder why. I do think P:TG is totally nuts to insist that fragrances smell the same on different people, though. They don’t, they really don’t, even after the topnotes have burned off. I adore, adore Tabac Aurea – but that day last winter I put on three spritzes (neck and both wrists), I about choked to death. Aargh. It wasn’t until recently that I noticed the bit about perfume strength on the website, wish I’d realized earlier. And I read my P:TG in bed sometimes too… I wouldn’t be surprised if my copy smells like Shalimar Light! Beautifully evocative reviews of both scents – I especially loved the comparison with a ray. “Wet velvety feel” is perfect, having stroked a few myself. Now I didn’t care for the clove note so much in Champagne de Bois, which made the composition feel more angular overall, though still with a fine rendition of the sandalwood note. FS, aren’t those rays amazing? they felt nothing like I’d imagined they would. “Angular” is a good description; CdB is so much less nuanced than BdI. I still enjoy it a great deal, though, particularly since my decant of BdI is so thin (pout, mourn, sigh). I recently bought a small vial of sandalwood essential oil that purports to be santalum album – which I doubt – and sometimes layer a drop of that with my BdI, which amps it up a bit, but then I miss some of the gingerbread accord, which is my favorite part. Read this through twice as I cannot pick out individual notes. I read reviews like this and think, “Really? Wow! You can smell that? !” Wish my nose was more discerning but alas, it’s not meant to be. I just get one glob of smell and have decided that works for me. Way too hot to try either of these again (in the 90’s) so will have to wait. BdI was OK as I remember. Nothing that bowled me over. CdB was lovely but again, not wowed but certainly worth re-visiting. Femme Jolie is the one I dearly love. Opal sounds right up my alley but Laurie was out of it by the time I ventured to her website so am jealous that Tamara knows all about! Totally off topic–Discovered the other day that Liz Zorn is in Cincinnati–my corner of Ohio. When things settle down here (ha!) I need to explore! Tiara, I love being able to pick out notes! I think that started with comparing fragrances with similar notes, and since then I have found it useful to pick up small vials of raw materials, particularly floral absolutes, in order to learn to identify things. Not everybody likes to do that, which is fine. You like what you like, I say, and that applies to how you want to appreciate perfume, too. “As a whole” is perfectly acceptable. I still haven’t tried Opal either – but Femme Jolie was just… Wrong… on me. I don’t know why. I’ve heard it compared favorably with Fem du Bois, which does this weird disappearing-reappearing act on me (Laurie suggested I’m anosmic to Iso E Super), so I wanted an alternative. But FJ was harsh and borderline unpleasant, and I still don’t know why. Oh, go and play at Soivohle! I haven’t spent a lot of time with those scents, but I know a lot of people really admire them. Thanks for the throwdown — I loved it! I’ve been curious about the SSS perfumes lately. I am definitely with you on the disastrous formulation of BdI “Les Exclusifs” eau de toilette. I can barely smell it. It’s very frustrating. But I got a bottle of the BdI parfum last year from a Chanel boutique, and it’s pretty glorious. It’s much much more powdery/No. 5-like than the vintage, but it’s so much better than the edt. I say: Don’t bother with the edt — call up a Chanel boutique and get the parfum! A half-oz bottle of the parfum costs much less than one of those massive and watery edt bottles, and you’ll get so much more pleasure out of it! Gasp! So… it’s NOT me? I’m not sure whether to be relieved that I’m not losing my mind, or worried about the people who said it smelled fine to them, or annoyed that Chanel has Screwed Up a Work of Genius. I’m all three, I suppose. I’m starting to seriously consider splitting a bottle of the parfum… I don’t think I could swing a full bottle for myself, not with all the other stuff I have to wear. SSS scents are all well-done, even the ones I don’t care for, and they’re easily sampled and easily purchased – at least, they will be when Laurie gets her wrists back and can start bottling again. My absolute favorite, can’t-live-without-it, scent from SSS is Tabac Aurea. I see that TPC has the EDT, the pure parfum, and some vintage pure parfum. The latter two are Gasp! expensive. Hopefully you will get a good deal through a split. But speaking of Chanel parfums, one of my ordinary ol’ department stores has done a makeover of its fragrance and cosmetic floor and they now have easily accessible testers of some Chanel parfums. Just the No 5 and 19 etc, but this is still a big leap forward. None of my local department stores have offered parfum testers before. Very nice for a tiny spritz as I breeze by at lunch time! Oh, Anne – lucky you, finding a spritz of Chanel parfum on a lunch break! That really would be an uplifting part of the day. I love a good perfume throwdown! I have not touched a Chanel in years! I used to wear Coco many moons ago and I love Egoiste, but I haven’t explored anything new since I became a perfume nut. So, along with No.19, I must try BdI. I already have a few SSS frags on my test list, CdB being on of them. It sounds divine. SSS scents are generally well-done, even the ones I don’t particularly enjoy myself. I also avoid Lauder. They ones I have tried smell like urine to me. I am going to try Aliage though. We’ll see if I have success with at least one EL. EL=pee?? It’s funny, I can’t pin down what bothers me about them, except that it’s something in the base, and something I cannot really smell but that makes me feel nauseous. I still have not smelled Alliage, although I don’t hold out any hopes that it would be any better. Big green/bitter leathers are Scary, in my book (see Bandit, eek). Thanks for the great reviews! I love both of these. I think a bottle of the Bois des Iles in extrait is on my wish list. I hope I can avoid the “faint” Edt that way. I’m starting to get nervous that if I don’t buy it soon, all the sandalwood in the world will be gone, or illegal or something. Also, I just can’t use 200ml of perfume. I’d much rather have the small extrait bottle. 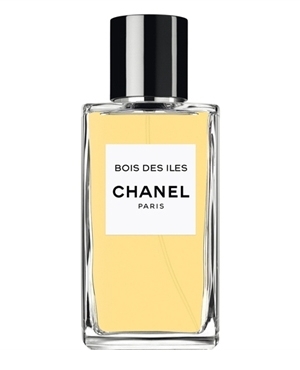 My local Chanel doesn’t have extrait in stock but they say they can order it. K, you don’t know how jealous I am of the words, “my local Chanel”… arrrrrgh. I know – how could you ever use up one of those monster LE bottles?? Another fabulous post, Mals! I, too, was anxiously awaiting the throwdown review. I love Bois des Iles. In fact, my very first fleabay bid was on a vintage bottle of EDC (which I think I paid too much for but that’s how it goes). Like you, I had first smelled BdI from an order placed on TPC. I think it was part of an introductory set for the budding perfumista, or words to that effect. I’m quite sure it was not the Les Exclusifs version and I loved it. Anyway, when I received the EDC it smelled off and I started ruing having paid so much for an “off” vintage bottle. However, after a while it did start getting lovely, though very close to the skin. Since that purchase I was able to obtain a small vintage bottle of parfum … (the tiny bottle that I’ve now come to realize was used in the vintage Chanel coffrets). The stopper was frozen and there was very little left of the juice and it was dark but I did manage to open it. This time, I was prepared for the perfume to be damaged but luckily only very brief seconds of “off” smell hit my nose (and only the first time the stopper was dislodged, not subsequently) and it was glorious after that. After reading CdB was similar to BdI I placed a sample order which included CdB and BdI parfum from TPC. I need to re-test the CdB because I remember thinking there was something in there I just did not care for as the scent developed. The modern BdI parfum is quite wonderful, too … but nothing like the teensy little amount I have of the vintage. Velvet is the perfect word for it, it is gorgeous. I am anxious to re-try the CdB but shall do so in cooler weather. Thanks for the great review! Hi, Connie! Vintage Bois des Iles… ahhh. I’ll bet it really is lovely. I do love vintage stuff – you just have to exercise a bit of patience, and you’re so often rewarded with something gorgeous. re: CdB – not everything is for everybody, of course, but I like it a lot, and it is more suited to cooler weather. Thanks for the review Carol! You’re right, I do love BdI and it’s flattering to have CdB compared to it. I agree that the new Exclusives version isn’t quite the same as the old vintage version. The vintage parfum seems to have the nicest sandalwood accord. Working on something new with a pretty sandalwood base plus moss, tonka, patch, jasmine, rose, amber, spices, soft peach, vanilla. Will say more on it soon. Thanks for dropping by, Laurie! And thanks for sharing about what goes into your creations – I honestly think it is fascinating to find out tidbits about what makes a scent work the way it does. Your “something new” sounds gorgeous. I’ll be haunting your blog to find out! Readers, do yourself a favor and go check out Laurie’s blog, to find out what’s shaking over at Sonoma Scent Studio – I think some good stuff is in the works! Oh, my, oh, my. And just after I was thinking about the fact that my sandalwood nose was set by Art of Shaving Sandalwood, which I’m told is really eucalyptus, and that therefore I should reset it. Must try both. Must try the Chanel parfum. Hey there CF – I have not smelled AoS Sandalwood and don’t share the reference. I did, however, recently pick up a small vial of something purporting to be “East Indian santalum album essential oil,” and it smells *wonderful*. I don’t think you can go wrong with either of these. Even if they don’t suit you (I can’t remember your position on spices, and CdB is fairly spicy), they’re worth smelling. I did read recently that you were lavished with a bottle of Shiseido White Rose… so this is IT? Your rose? Cool. No other review has ever compelled me to want to try BdI, but this one did it. For reasons that no one, least of all me, understands, I friggin’ love sting rays. Every weekend I take my books down to the Baltimore aquarium and plop down next to the sting rays to study- it feels so peaceful. What a fantastic, beautiful description for what sounds like a stunning scent. And the Balmer aquarium is terrific, isn’t it? We’ve been several times, and the rays are still my favorites (although I spent one visit enthralled with the seahorse exhibit). Thanks for this head-to-head! I have both, and the similarity between the two never crossed my mind. I find BdI somewhat insipid (*ducking for cover*), but I am not a sandalwood fan, to be fair. CdB is one of my favorite scents by SSS, and I wear it faithfully in the cold weather. I love smelling it on my sweaters – as you say, it lasts and lasts…and what a bargain! Hey, Elizabeth – just wondering, which BdI do you have? Is it the Les Exclusifs edition? Because if so, I might not be all that surprised that you don’t find it compelling. It seems so thin to me. CdB does last foreverrr. Nicely so, of course. I don’t know which one it is, since it’s a decant. I think it probably is the LE version though. You have that big bottle? Ooh, lucky you. I don’t know that I could go through a whole 200ml of one scent… I have so many little bottles… but it is nice to be able to spritz away and not worry. Glad you get longevity out of it – I was very, VERY disappointed in my decant. I do tend to have scent-eating skin, though, so maybe that matters. And so glad you enjoyed your week with it! It is beautiful. I thought about BdI for the Signature Scent Challenge, too, but it just didn’t feel like “the one.” Also, I only have that one decant, and I figured I’d use up so much of it in a week that I decided against that.